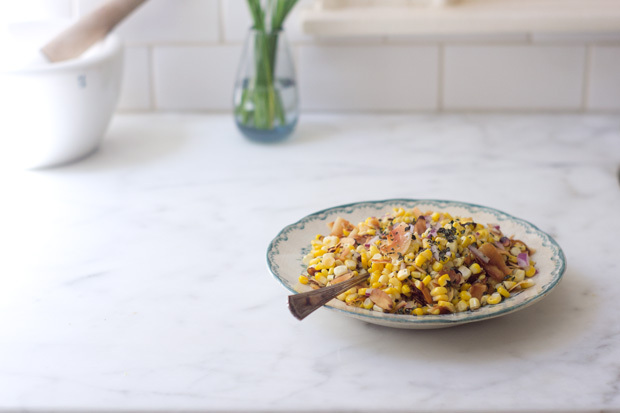 A favorite corn salad perfect for summer. Here's how it goes down. Five ears of corn, shaved in quick fashion, then sautéed in a bit of butter, or olive oil. I tricked it out with thyme, red onions, toasted almonds and coconut. Simple. Delicious. Melt the butter in a large skillet over medium heat. Add the corn, sprinkle with a couple pinches of salt and stir well, you want all the corn to be coated. Cook for just a minute, until the corn looses its raw edge, stir in half the thyme, and then transfer the corn to a large serving bowl. Just before you're ready to serve, add most of the coconut flakes, most of the almonds, the rest of the thyme, red onions, and citrus juice. Stir well. Taste, season with more salt, to taste, and serve topped with the remaining coconut and almonds (and another jolt of juice if needed! ).